Both benches had plenty to celebrate in a supernight sweep of Willard Tuesday at home. Republic thrashed rival Willard Tuesday night, winning all six games on a raucous “supernight” of boys and girls basketball in Republic. Both the Tigers and Lady Tigers remained undefeated in the Central Ozark Conference through five games. In the girls game, Jade Kirby had 13 points and Republic ground out a victory in a game in which neither team shot very well. Willard burned Republic several times in the first half with fast-break points after Republic missed a shot. With 2:30 remaining in the first quarter, Kris Flood called a time out after another Willard layup put Republic in an 11-6 hole. 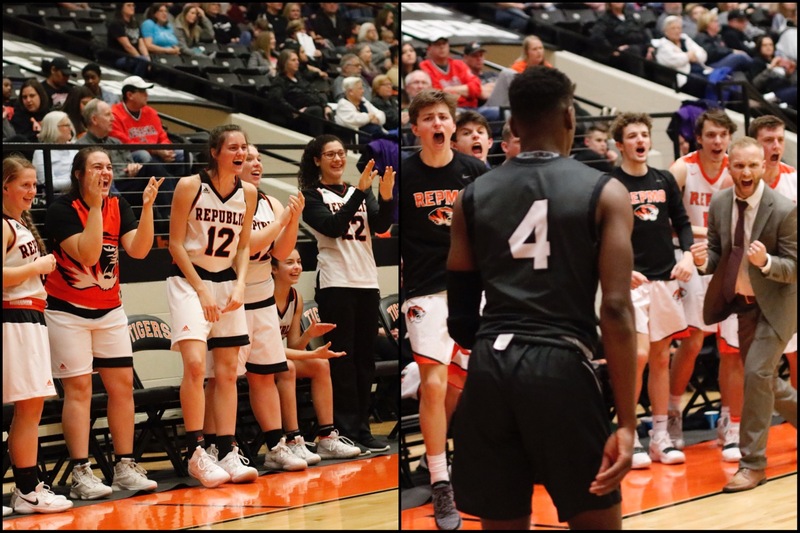 Neither team scored for the remainder of the period, but Republic reeled off ten straight points in the second quarter to nab a 16-11 lead, before Willard scored six consecutive points of its own. Willard led 17-16 at halftime. Republic outscored Willard 8-4 in the third quarter to take a 24-21 lead, and after Willard scored to open the fourth period, Halli Bartelsmeyer buried a 30-footer to stretch the lead back to four points, 27-23. With 1:15 remaining, a three-pointer at the other end of the court gave Willard its first lead since halftime, but Jade Kirby answered with a driving layup, cutting through the defense to give Republic a lead it would never relinquish. Willard cut the lead to two points with 16 seconds remaining, but Clara Fronabarger hit a free throw and Republic got a defensive stop to seal the win. Anna Bell also made a little history for the Lady Tigers, taking a charge for the 20th time this season. That breaks the single-season record of 19 previously held by Lindsey Carlson. Carlson also had the career record of 30+, and Bell now has taken 31 charges in her career. Republic is 14-7 (5-0 in the Central Ozark Conference). The Lady Tigers host Joplin Thursday. Jade Kirby not only led the Lady Tigers in scoring, but when Republic fell behind in the final two minutes, she hit the biggest bucket of the night to help the Lady Tigers retake the lead. For her performance, she’s our Farr Better Player of the Game. Republic used a 13-3 run in the first half to set the tone for the rest of the game, controlling the pace most of the way in a 58-44 win. Broc Smith led Republic with 19 points as the Tigers won their fifth game in five tries in league play this year. Coach Tim Brown said his team’s strong start was especially important because of Willard’s desire to play at a faster pace. Smith said Broc Smith’s three three-pointers in the first half helped open up the offense for the rest of the team. Trent Rackley had seven at halftime and Race Looney had six. Looney finished 14. “We were trying to have some long possessions. We knew that they were very comfortable coming out and guarding and getting spread out, and Race did a good job of attacking the paint. That was something we talked about in our game plan, and Race did a great job of executing it for us,” Brown said. Willard’s Daniel Abreu, one of the top scorers in southwest Missouri, finished with 22 points; but he scored only two field goals in the second half. Despite his point total, Brown was happy with the way his players defended. “I thought defensively we did a fantastic job. We made it hard on him and I thought we guarded our rear ends off,” Brown said. “Credit to Jaden (Duvall) and Race… and Joe (Rexroat), and then our guys doing a great job of helping. We had a great game plan and our guys executed it tip top. Republic improves to 16-6 overall and 5-0 in the COC. They face Joplin at home Friday night.